Jackie Luo sent out this Tweet in 2018. Are you embarrassed to share your salary? Yeah, a lot of us are. Software engineer Jackie Luo makes the case that we can’t improve the pay gap (for women or people of color) in industries like tech without being more transparent. 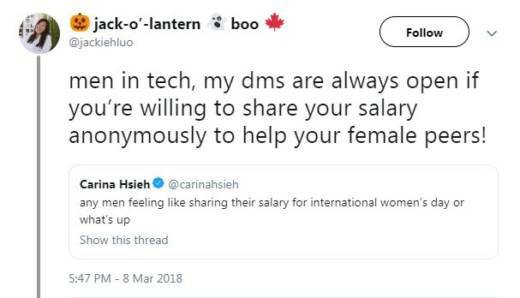 So, she asked men in tech to share their salaries via Twitter. And thousands did. Read Jackie's full story "I Know the Salaries of Thousands of Tech Employees" on Medium. And you can read her Tweet thread asking men to share salaries here.